Florida Politics posted a story this week on the four major impacts from Hurricane Michael on forestry in the Panhandle of Florida and in southwestern Georgia. They are storms, long-term flooding, fire threat, and pine beetle. 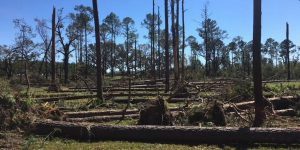 With so much destruction of the forests there, the groves are now especially susceptible to the impacts of severe storms and flooding rains. Trees that are down or are dead will increase fire risks, especially in the next drought, and the trees that are left will be more likely to be infested with pine beetles. You can read more here. Previous: Is the Southwest entering its next mega-drought? Next: How do climate models work?